Bios: Megafauna starts where the predecessor game Bios: Genesis left off, with the invasion of the land on the daybreak of the Phanerozoic eon. Starting as either a plant, mollusk, insect, or vertebral skeletal type, your flapping, paddling, and squawking carnivores and herbivores make a beachhead on one of the drifting continental plates in the Cambrian, Their struggle for terrestrial dominance may eventually include language-based consciousness. Although this achievement elevated a certain mammal species to notoriety, in your game things may occur differently. 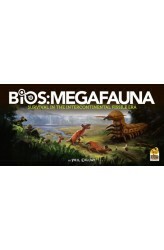 This second edition of Bios: Megafauna is an evolutionary descendant of American Megafauna but as a part of the Bios series of games it is linked to the game Bios: Genesis. I.. 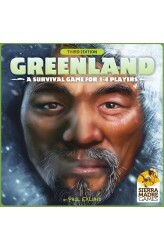 This new edition of Greenland includes the Sea Sami expansion pack so it is playable with up to 4 players. The four players in Greenland represent the Tunit (Player Green), Norse (Player Red), Sea Sámi (Player Blue), and Thule (Player Yellow) tribes inhabiting Greenland from the 11th to the 15th centuries. As a tribe, you attempt to secure food, resources, and technology to increase the size of your tribe and support children, elders, and livestock while also wiping out competing species or gathering resources to collect victory points. You must work around the weather and the extinction of natural resources as well as negotiate deals to protect your wives while you decide between monotheism or polytheism. In this tableau-building game, you'll send your population out to hunt na.. It's 43,000 BC in Ice Age Europe, the dawn of modern man. 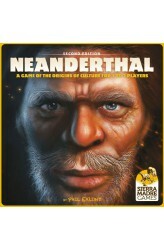 In Neanderthal, you are one of three human species: Archaic, Neanderthal, or Cro-Magnon. Assign your males to hunt Pleistocene megafauna, but try to avoid being eaten by predators. Assign your women for teaching your children vocabulary, leading to cognitive fluidity in the next generation and to a tribalistic culture. Specialize your elders for fire, war, big game, inventions, or animal domestications. Choose between three mating strategies: promiscuous, harems, or pair bonding. Victory depends on which strategy you choose, and may include your hunters, elders, women, vocabulary, trophies, inventions, or domesticated animals. At this point, the players have developed to the point where the companion game Greenland begins, so.. The 7 wonders of the great civilizations were built by slave-power, and societies' need to enslave weaker neighbors went unquestioned for millennia. Until the day an audacious petition was sent to Parliament, not just to end slavery in England, but throughout the entire world! In this game, you assume the role of an abolitionist during the Age of Enlightenment, either a Parliamentarian, an evangelical, or a private philanthropist. Assign warships to blockade slave ports or intercept slave ships, install missions, trading posts, and colonies in foreign lands steeped in serfdom, challenge the institution of slavery on moral and legal grounds in courts, and sanction underground railroads, slave revolts and revolutions. Play in cooperative-competitive, cooperative, or solitaire modes. If vi..
Pax Porfiriana – Latin for "The Porfirian Peace" – refers to the 33-year reign of dictator Porfirio Díaz, who ruled Mexico with an iron hand until toppled by the 1910 Revolution. As a rich businessman (Hacendado) in the turbulent pre-revolutionary borderlands of the U.S. and Mexico, players compete to build business empires of ranches, mines, rails, troops, and banks while subverting opponents with bandidos, Indians, and lawsuits. Each turn goes as follows: 1. Action Phase: Perform three actions, such as play new cards, get new cards from the market, speculate on cards in the market, buy land, or redeploy troops. 2. Discard Headlines: Remove any Headlines (i.e. cards with the Bull-Bear icon) that have reached the leftmost position in the Market. 3. Restore Market: Restore th..
As a Renaissance banker, you will finance kings or republics, sponsor voyages of discovery, join secret cabals, or unleash jihads and inquisitions. Your choices determine whether Europe is elevated into the bright modern era or remains festering in dark feudalism. In Pax Renaissance, you have two actions each turn. 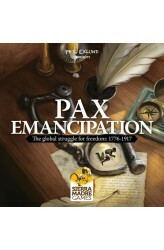 As in other Pax games, you can acquire cards in a market, sell them out of the game, or play them into your tableau. 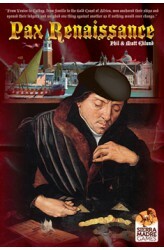 You can also stimulate the economy by running trade fairs and trading voyages for Oriental goods. A map of Europe with trade routes from Portugal to Crimea is included, and discovering new trade routes can radically alter the importance and wealth of empires, ten of which are in the game. Four victories determine the future course of West..